"Tastefully updated single home on a low traffic street! 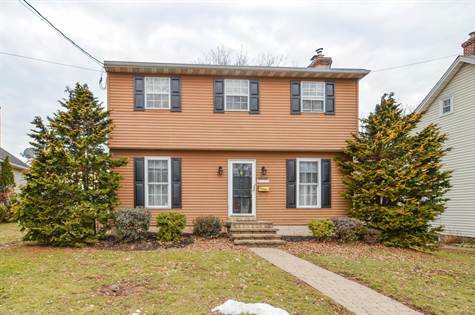 3 bedroom 2 bath Pennridge Colonial "
"Trade up to this home and we'll buy yours" Tastefully updated single home on a low traffic street! 3 bedroom 2 bath Pennridge Colonial boasts a finished lower level, large fenced in yard and newly paved driveway to fit 4 cars! Most of the home has been updated with new flooring and paint. Spacious main level includes a large living room with wood burning fireplace, a formal dining room, nice sized kitchen and convenient powder room. Upstairs are 3 bedrooms including the Master, complete with a walk in closet and access to the main bath. Lower level has been partially finished to add a family room with wood stove that keeps the entire home toasty! The unfinished side offers plenty of storage and a laundry area with newer front load washer and dryer. Great space to entertain outside with a patio and large fenced in yard! This home is a must see! Easy commuting to Rt 309, PA turnpike and all necessities. Call today to schedule a showing!